The Smoky Mountains are a prime location for outdoor lovers, whether you are a serious enthusiast or just like beautiful scenery. At this time of year, many people are enjoying their last few ski runs of the year, but there are many other ways to enjoy the great outdoors in the Gatlinburg area. Why not plan a refreshing trip to kick off spring and go hiking in the Smokies? With our wide selection of Gatlinburg cabins and chalets, wherever you head during the day, you will return to plenty of amenities in a peaceful setting. If you are just getting your legs under you, a great choice for a lighter walk is Clingman’s Dome. Although it is possible to reach the highest point on the Appalachian Trail via several excellent all-day hikes, this amazing spot is accessible by car. The 360-degree panorama is not one you will soon forget and you can always donate to the national park to offset the drive there. This spot is a perfect place to watch the sun rise or set, making is a great date spot. Combine a walk here with a stay in A Mountain Hideaway and enjoy the seclusion that a trip the Smokies offers. One of our one-bedroom Gatlinburg cabins and chalets, this quiet spot has a wraparound porch with a hot tub and a view of the Smoky Mountains. A king bed, full kitchen, stone fireplace, and pool table offer plenty of ways to enjoy one-on-one time with your sweetheart. With winter turning to spring, Porters Creek is an excellent way to enjoy the wildflowers that blanket the national park in March and April. This moderate hike is only four miles and takes you along a beautiful mountain stream, with the famous trillium flowers carpeting the ground. You will even see an old farm and homestead and a waterfall. Enjoy walking this trail on a family reunion as it should not be too difficult for older children, but will stretch the adults’ legs as well. We have a number of Gatlinburg cabins and chalets to house a larger group, like Bear Crossing, a three-bedroom cabin with plenty of room for up to eight. It has two wood-burning fireplaces, a hot tub, and a full kitchen, making it a relaxing place to which to return. Plan a getaway for some serious hiking in the Smokies and stay at Canterbury Cottage, at two-bedroom cabin that can sleep up to six. Get up early and tackle Mt. 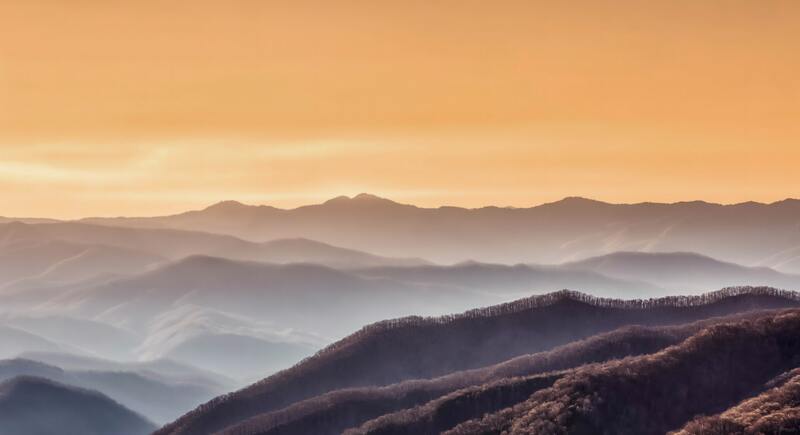 Cammerer, a challenging 11.1 mile hike that rewards hikers with jaw-dropping panoramas of the Smokies. Upon your return, everyone will have room to soak their tired muscles in either the whirlpool or hot tub, while you can all gather round the stone fireplace to recap your adventure afterwards. A full kitchen makes it easy to prepare snacks and a picnic. Wherever you hike, enjoy all the rewards of hiking in the Smokies without carrying a tent and sleeping in the great outdoors at one of our Gatlinburg cabins and chalets.